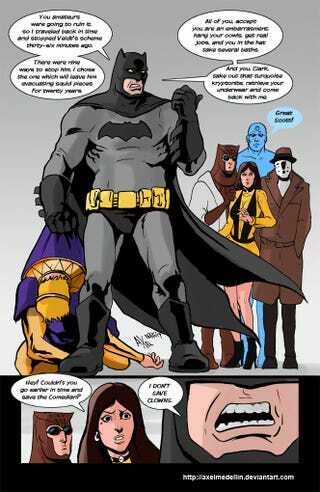 What If Batman Had Been In Watchmen? What happens when The Dark Knight Returns version of Batman faces off against Alan Moore's smartest man on the planet? Only funny things. Artist Axel Medellin drew this short comic for the latest installment of Comics Should Be Good's The Line It Is Drawn art challenge. This week, artists were asked to send a comic book character back in time to change a significant moment in comics history. Medellin took a suggestion to have the older, Dark Knight Batman lend the heroes from Watchmen a helping (but grim and gritty) hand. Head over to deviantART to see more of Medellin's work, including some of his previous entries. (I highly recommend the Godzilla Xenomorph.) And there are more time-traveling comics hijinks—the Red Skull finding a still-frozen Captain America, the Power Rangers interfering with a Green Lantern massacre, and Lady Liberty preventing Jerry Siegel and Joe Shuster from signing away ownership of their characters—at Comics Should Be Good.